MITZPE RAMON, ISRAEL–Today I went to one of my favorite geological places: Makhtesh Gadol in the northern Negev highlands of Israel. 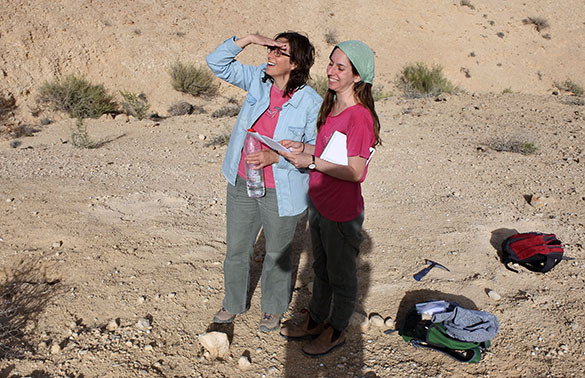 It was a special day as well because I worked there with two excellent geologists: Yael Edelman-Furstenberg of the Geological Survey of Israel, and Yael Leshno, a graduate student at Hebrew University beginning a project comparing the Middle Jurassic communities in the south of Israel with their temporal equivalents in the north. Yael E-F is one of Student Yael’s advisors; I am on her dissertation committee. 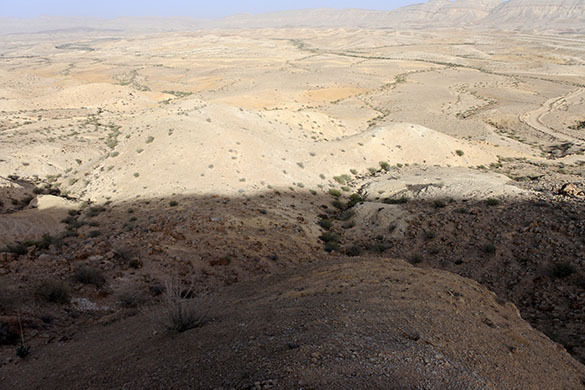 The two Yaels are shown above in the Matmor Hills of Makhtesh Gadol sorting out the complicated stratigraphy. Yael Edelman-Furstenberg is on the left and Yael Leshno is on the right (along with my intruding shadow). 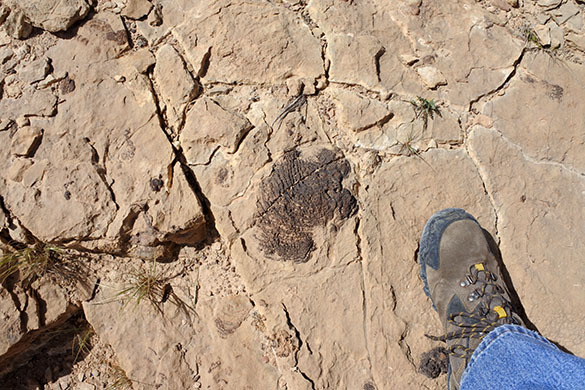 We are standing at GPS location 055, where fossils from Subunit 51 of the Matmor Formation are abundant. 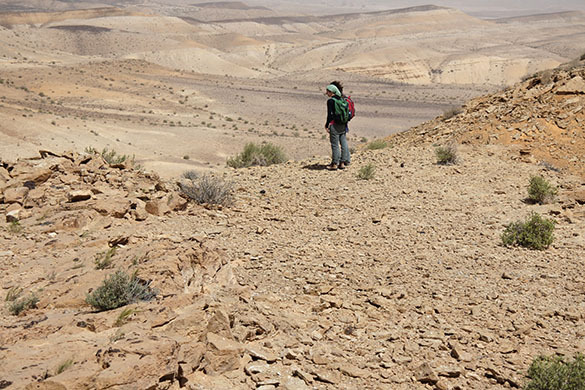 Student Yael is presently surveying the Middle Jurassic sections in Makhtesh Gadol to find suitable places to do stratigraphic fossil collecting and quadrat measurements. We spent some time studying “the oolite unit” (Subunit 63) at the top of the original Goldberg (1963) stratigraphic section. It is, as Goldberg wrote on his column, a “characteristic guide horizon”. 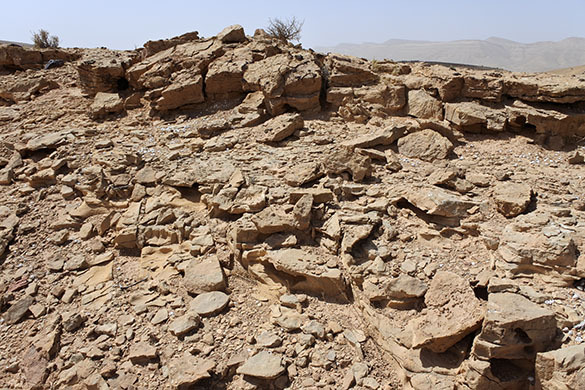 It’s curious because there are no other oolitic units in the Matmor Formation, and because it loses its oolitic nature a few hundred meters south and north of the section. I will make a thin-section of this rock and see what’s up with these ooids. 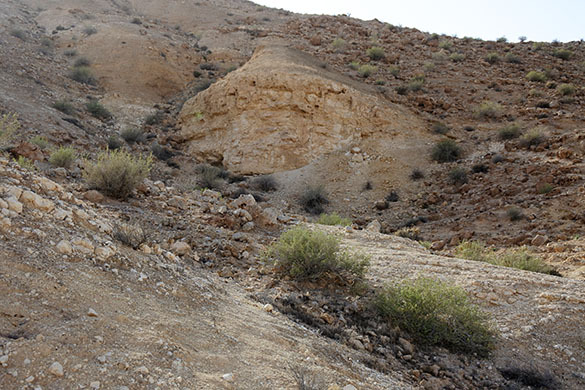 The top of the triangular cliff has an exposure of a fossiliferous marl of the Matmor Formation. In 2005, Jeff Bowen (’06) perched up there for hours and collected tiny specimens. This would have been Jeff’s view of the makhtesh as the sun began to set. I hope he appreciated it! Finally, here is a bathroom counter (the best light in my hotel room) image of a calcareous sponge I found in Subunit 60 (just below Jeff’s location above) with embedment structures (bioclaustrations). 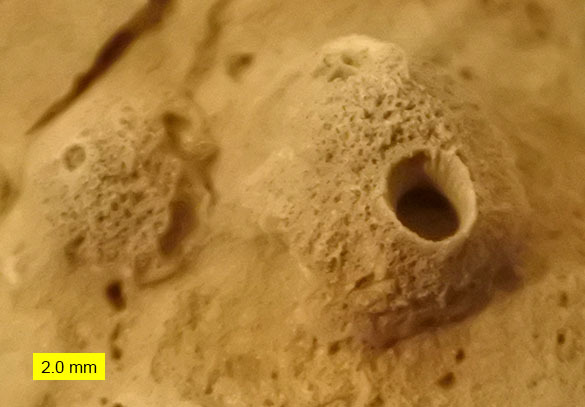 Some worm-like organisms lived within the sponge body, and the sponge grew skeleton around them. I’ve not seen these before in sponges.